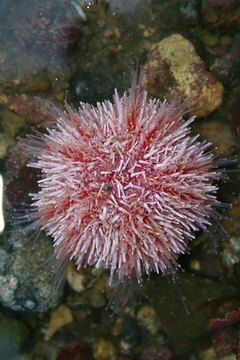 The sea urchin is a round, spiny marine creature found in most of the world's oceans. They come in many colors, each related to its habitat. The sea urchin is valuable in keeping algae under control. Sea urchins gather in large groups that contain both males and females. The females expel hundreds of millions of orange eggs, which prompts the males to release their clouds of white sperm. Urchin eggs float in the warm sea water for up to eight weeks. They then hatch into larvae and drop to the floor of the ocean where they attach to a rock with a sucker foot while they mature. Sea urchins main food is algae but they are scavengers too and some will eat mud or sand, extracting the minute amounts of organic material present. Sea urchins grow to an adult size of 3 to 10 centimeters and reach sexual maturity at four to five years. The Red Sea urchin has a lifespan of 30 years or more. Some species are in danger of going extinct due to the growing popularity of their roe as a seafood delicacy.